Batch operations can minimize the number of round trips required to write and read objects to and from your directory, improving the overall performance of your application. Batch write provides the SQL database-equivalent transaction semantics. All operations successfully complete, or if any operation has a failure then none of them are applied. Using batch reference you can create an object and use a reference to the new object for further action such as adding it to a relationship, reducing overhead of using a read operation before a write operation. Use BatchWrite operations to perform multiple write operations on a directory. All operations in batch write are executed sequentially. It works similar to SQL database transactions. If one of the operation inside batch write fails, the entire batch write has no effect on the directory. If a batch write fails, a batch write exception occurs. The exception contains the index of the operation that failed along with exception type and message. This information can help you identify the root cause for the failure. Batch reference names are supported only for batch writes when you need to refer to an object as part of the intermediate batch operation. For example, suppose that as part of a given batch write, 10 different objects are being detached and are attached to a different part of the directory. Without batch reference, you would have to read all 10 object references and provide them as input during reattachment as part of the batch write. You can use a batch reference to identify the detached resource during attachment. A batch reference can be any regular string prefixed with the number sign / hashtag symbol (#). For example, in the following code sample, an object with link name "this-is-a-typo" is being detached from root with a batch reference name "ref" . Later the same object is attached to the root with the link name as "correct-link-name" . The object is identified with the child reference set to batch reference. Without the batch reference, you would initially need to get the objectIdentifier that is being detached and provide that in the child reference during attachment. You can use a batch reference name to avoid this extra read. Use BatchRead operations to perform multiple read operations on a directory. For example, in the following code sample, children of object with reference “/managers” is being read along with attributes of object with reference “/managers/bob” in a single batch read. Each request to the server (including batched requests) has a maximum number of resources that can be operated on, regardless of the number of operations in the request. This allows you to compose batch requests with high flexibility as long as you stay within the resource maximums. For more information on resource maximums, see Amazon Cloud Directory Limits. Limits are calculated by summing the writes or reads for each single operation inside the Batch​. For example, the read operation limit is currently 200 objects per API call. Let’s say you want to compose a batch that adds 9 ListObjectChildren API calls and each call requires reading 20 objects . Since the total number of read objects (9 x 20 = 180) does not exceed 200, the batch operation would succeed. The same concept applies with calculating write operations. For example, the write operation limit is currently 20. If you set up your batch to add 2 UpdateObjectAttributes API calls with 9 write operations each, this would also succeed. In either case, should the batch operation exceed the limit, then the operation will fail and a LimitExceededException will be thrown. The correct way to calculate the number of objects that are included within a batch is to include both the actual node or leaf_node objects and if using a path based approach to iterate your directory tree, you also need to include each path that is iterated on, within the batch. 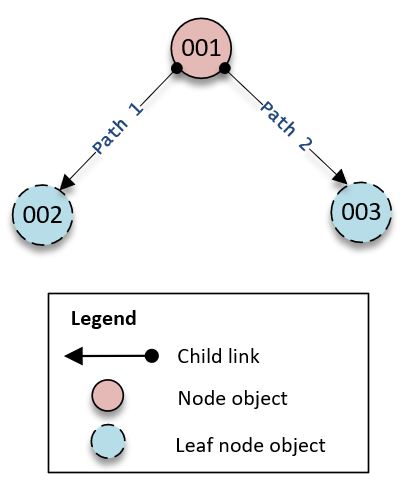 For example, as shown in the following illustration of a basic directory tree, to read an attribute value for the object 003, the total read count of objects would be three. Similarly, for the number of attributes we need to count the number of attributes in objects 001 and 003 to ensure we don’t hit the limit. Batch operations in Cloud Directory can sometimes fail. In these cases, it is important to know how to handle such failures. The method you use to resolve failures differs for write operations and read operations.